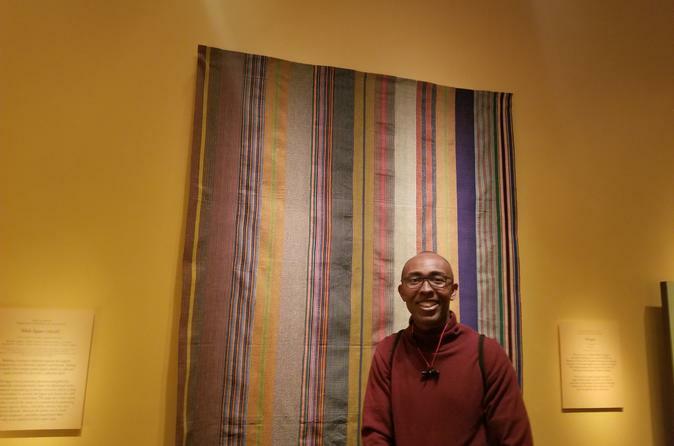 Join Emmanuel Gogo, originally from Ghana (West Africa), for a two hour tour of the Smithsonian National Museum of African Art. Emmanuel will interpret the messages found in the art for the group’s understanding of the richness of the many different African cultures represented at the museum. Our tour will transport you to selected countries in Africa to learn about their civilization, cultures, and how Africans have been influential in shaping the World’s developmental progress. We will see African wood art and interpret the symbols, utility, and messages; ceramics made by women for household, music, and governmental activities; baskets to show how brilliant an African utilized materials of canes and grass. Emmanuel Gogo — A DC licensed Tour Guide who was born in Ghana (West Africa). Emmanuel Gogo, is both a member of the Tour Guides Association of Ghana and a member of the Guild of Professional Tour Guides in DC. Please meet Emanuel outside of the entrance to the Smithsonian National Museum of African Art. Plan on arriving 15 minutes before start of tour for check in. The tour begins at 1:00 pm. Emmanuel will take group through three levels of the museum to see both modern, and historic art works. The Museum is an all inclusive mix of different cultures, time periods, and art work forms. You can expect presentation to go from historic art work to modern and back to historic art work as Emmanuel points out the best works to show the group. Group size can range from 15 to 20 people. The tour will last approximately two hours.